Fantain is a fantasy sports app available for Android users where you can play fantasy sports like Cricket, Kabaddi, and Football. Bookmyshow is the parent company of Fantain. So you can be sure that it's legit. There are two Fantain apps. One that is available on play store and the other that you can download from their website. Fantain app available on the Play Store hosts free contests with cash prizes and latter hosts paid contests. You can create your account on one and use the same credentials to log in on the other app. No need to create separate accounts. 1. Download the Fantain app from here. 2. Install & open the app and register with your email address or phone number. You can also login with your Facebook or Google account. 3. Enter the OTP to log in. 5. Verify your email address and phone number to get Rs. 25. 6. Verify your PAN card and get another cash bonus of Rs. 25. 7. You will get Rs. 50 when you deposit Rs. 100 or more. How Does Fantain Referral Program Work? 1. Go to the profile screen to see your referral code and click share to share it with your friends. 2. Once your friend registers as a new user, he should enter YOUR referral code when he is prompted. Remember only new users will be prompted for a referral code. 3. Once they verify their login via OTP process(Both Email & Phone number should be verified), you will both receive Fancash(cash bonus) of 25. 4. Once they verify their PAN CARD, you will both receive Fancash of 25. 5. Once they deposit money of Rs 100 or above you will both receive Fancash of 50. You can use pay 100% of the entry fee using the cash bonus. 3. You are eligible to receive referral bonus only after your friend has taken the necessary actions SUCCESSFULLY. 4. Your Referral Fancash will take up to 15 mins to reflect in your Fantain Passbook. 2 matches: contests under this category consists of two matches. If those two matches are of the same team like in a bilateral series, you just need to create your team of 11 players from those 2 teams. But if it's a league match and all the four teams are different, then you need to create your team that consists of players from all the 4 teams. You need to join the contest before the first match begins you can make two substitutions before every match(after the first match). 4 matches: The same rules apply to this but instead of 2 there are four matches. The winners of these contests are declared after the last match. Pick the SET OF MATCHES you wish to join. You can see the matches in this match set by clicking on the number of matches link. Then click anywhere else to go to the MATCH SET detail. The contests for that match set are listed on it. There are free and paid contests that you can join in. Click on the box that says ADD TEAM. This helps you pick your team for the match set. You can add up to four lineups. The cricket players are segregated into batsmen, bowlers, all-rounders, and wicket-keepers. You can select up to a specified number of players from each team. This varies depending on how many teams are in that match set. For instance, if it is two matches between the same two teams, you can pick up to 7 players from a team. But if it is two matches involving four teams, you can pick only 4 players from each team. You must select 3-6 batsmen, 3-6 bowlers, 1-4 all-rounders, and 1-2 wicket-keepers, with the total not exceeding 11 players. The total of 100 credits should not be exceeded. Once you select all 11 players of your team, the button at the bottom of the screen ‘next step’ will be highlighted. Similarly, you can create three other teams by swiping left and click on the ADD TEAM button. The next step is deciding which pool to participate in. For the free pool, you can click on the button ‘Submit’. If you have created more than one lineup, pick the one that you wish to submit for the pool. For the paid pool, ensure that you have sufficient balance. Please refer to Deposit for further clarifications. While submitting, check where the funds are being withdrawn from for the match. The options are from FanCash, Winnings, and Deposit. In the MATCH SET, between matches, you can do two substitutions per match. Substitution window will be open between matches and close before the start of the next match. Substitutions must also conform to the overall rules (number of players per team, number of batsmen, bowlers, wicket-keepers and allrounders, and salary cap). Submit the changed line-up, which will be taken into consideration for subsequent matches. Winners are declared at the end of all the matches on the match set, based on the highest points scored across all matches. There’s only one match. Your team will consist of players of two teams. Pick the match you wish to join. The next screen takes you to Match Detail. The lineups are listed on it. There are free and paid lineups that you can join in. Click on the box that says ADD TEAM. This helps you pick your team for the match. You can add up to four lineups. You must select 3-6 batsmen, 3-6 bowlers, 1-4 all-rounders, and 1-2 wicket-keepers. You cannot select more than 7 players from the same team. Once you click on all eleven players of your team, the button at the bottom of the screen ‘next step’ will be highlighted. Click on ‘next step’. You will be asked to assign a captain and a vice-captain for your team. Pick them and submit by clicking on the button below. Similarly, you can create 3 other lineups by swiping left and click on the ADD TEAM button. You can create up to 4 teams and submit them 30 minutes before the match starts. The only difference between the two is that there are free-to-join contests on one and paid-to-join on the other. 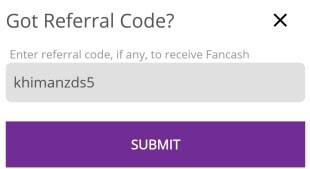 So, the referral code bonus you get one sign up can only be used on Fantain pro. You can download the Fantain pro app from fantain.com. The types of contests are the same on both the apps. You can use 100% of your referral bonus to join paid contests. You can withdraw your winnings from the Fantain wallet after you have verified your PAN card and bank details. The minimum amount that you can withdraw is Rs. 200. Fantain is great fantasy app to play and win some cash. You can play fantasy sports like Cricket, Football, and Kabaddi. You can get a cash bonus up to Rs. 100 when you refer your friends(they enter your Fantain referral code after registration) and verify their details. You can also get a bonus of Rs. 100 when you enter this referral code and verify your details: khimanzds5.